Question: What’s the best thing to do when it’s time to go back to school? Answer: Head out of town for a week in the field. 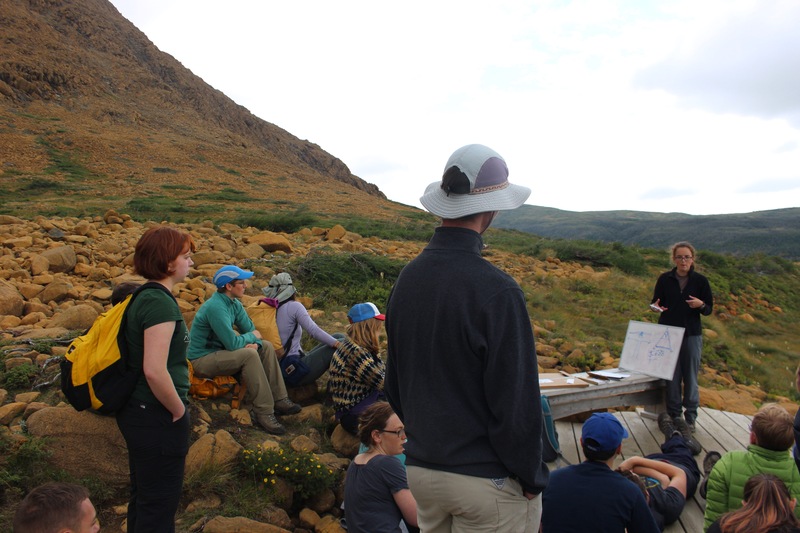 In late August Kristin Bergmann led a trip of EAPSters to see the world-famous Ediacaran fossils, ophiolites and suture zones, Snowball Earth deposits, Quaternary glacial valleys and fjords of Newfoundland, an island that straddles no less than three ancient continents. 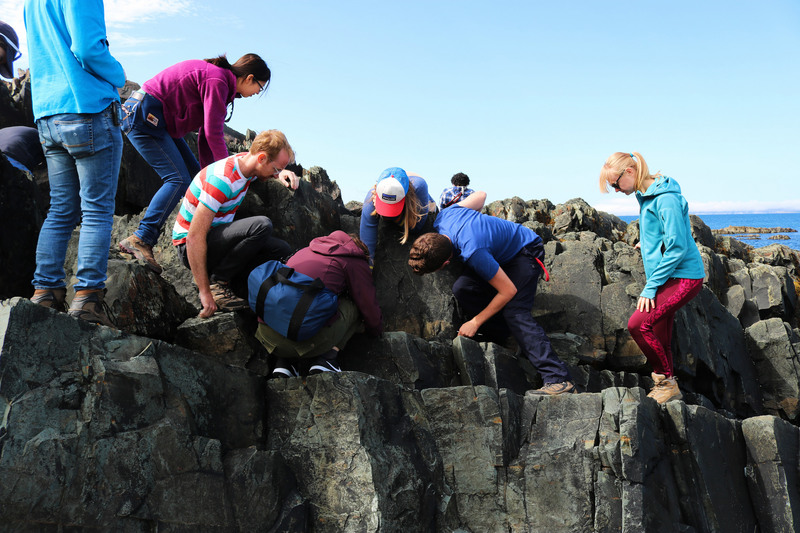 Bergmann, whose research focuses on reconstructing the record of environmental change from observations of sedimentary rocks spanning Precambrian to end-Ordovician time, was joined by fellow geobiology faculty colleagues Gregory Fournier and Roger Summons. The trip, open to students across EAPS irrespective of program, comprised five undergraduates, and four graduate students in the Program in Geology, Geochemistry and Geobiology (PGGG), two from the Program in Geophysics (PG), one from the Program in Planetary Science (PPS), two from the Program in Atmospheres, Oceans and Climate (PAOC), and eight members of the MIT-WHOI Joint Program. 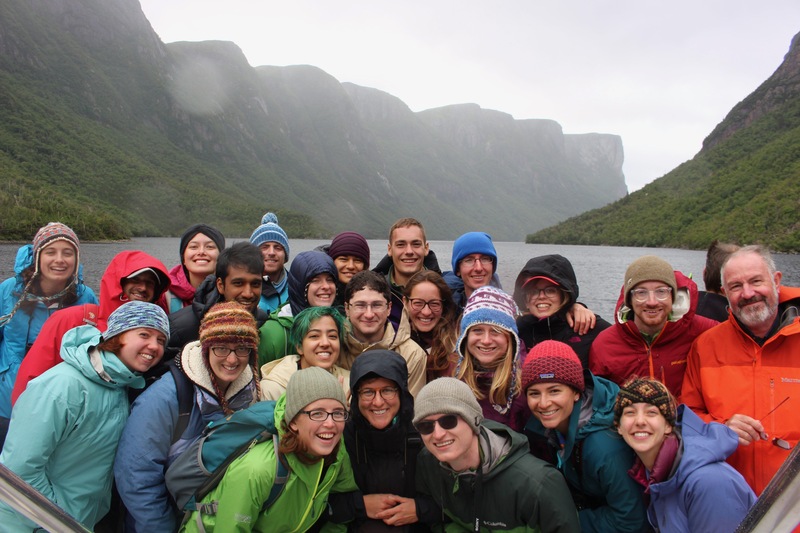 The educational vision for these trips (this is the third, the first, led in 2015, by Ben Weiss, Oliver Jagoutz and Leigh Royden, took a group to the Himalayas and the second, led by Tim Grove, took a group of students to the Cascades) is to bring EAPS students and faculty from across the department into the field, see a range of geology, and learn about it together through the multiple lenses the broad range of disciplines in the department provide. A particular highlight of the trip was the chance to see ophiolites and suture zones, the geologic records of past continental collisions. 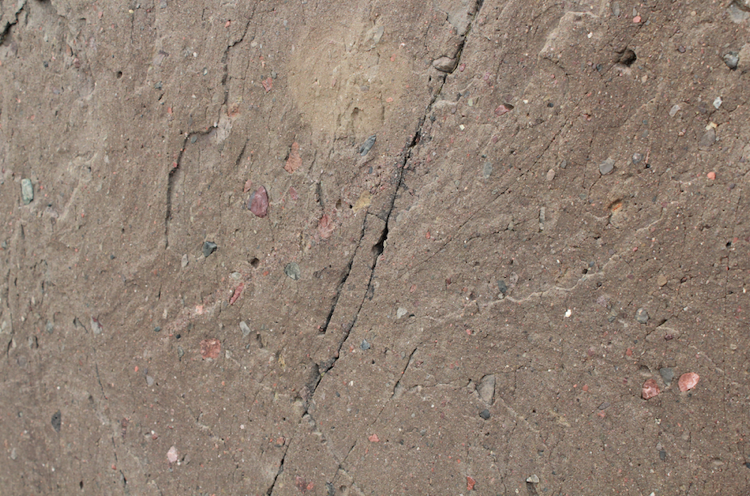 Bergmann explains, “When continents collide there are common rocks that get caught up in the collision -- like ophiolites which are formed when sections of the Earth's oceanic crust and the underlying upper mantle have been uplifted onto continental crustal rocks, and exposed above sea level. 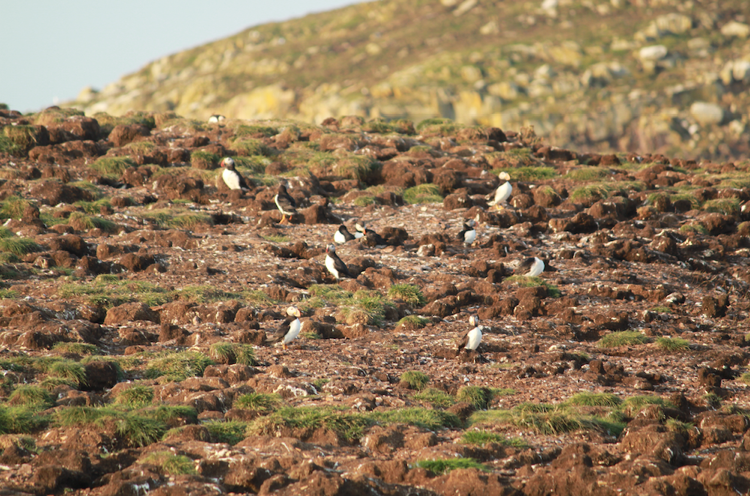 Newfoundland contains several suture zones, as a result of repeated collisions of continental fragments against North America. 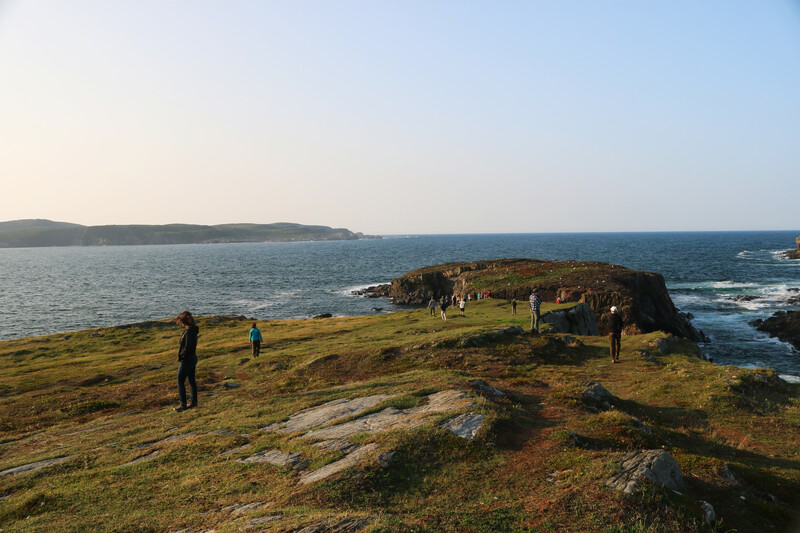 On a non-scientific note, by the end of the week nine trip participants had become honorary Newfoundlanders at a ceremony called a “screech in”. “Screech ins” vary but for the EAPS crew it involved eating "Newfie steak" (baloney), kissing a cod, and dancing with something called an ugly stick (a traditional Newfoundland musical instrument fashioned out of a household item or something from a tool shed, typically a mop handle with bottle caps, tin cans, or small bells), singing and reciting some Newfie speak. 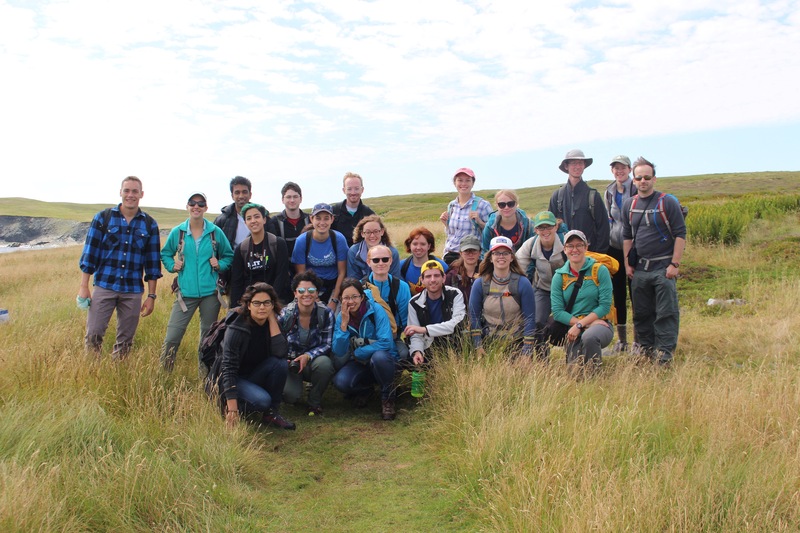 2017 trip participants: Elizabeth Wallace, Jonathen Hurowitz, Stephanie Brown, Andrew Cummings, Meghan Jones, Laura Stevens, Julia Wilcots, Clio Macrakis, Eva Golos, Jennifer Kenyon, Ekaterina Bolotskaya, Christine Chen, Brian Green, Mukund Gupta, Brynna Downey, Elisabeth Boles, Christopher Kinsley, Makayla Betts, Karina Hinojosa, William Shinevar, Samuel Goldberg, Marjorie Cantine. 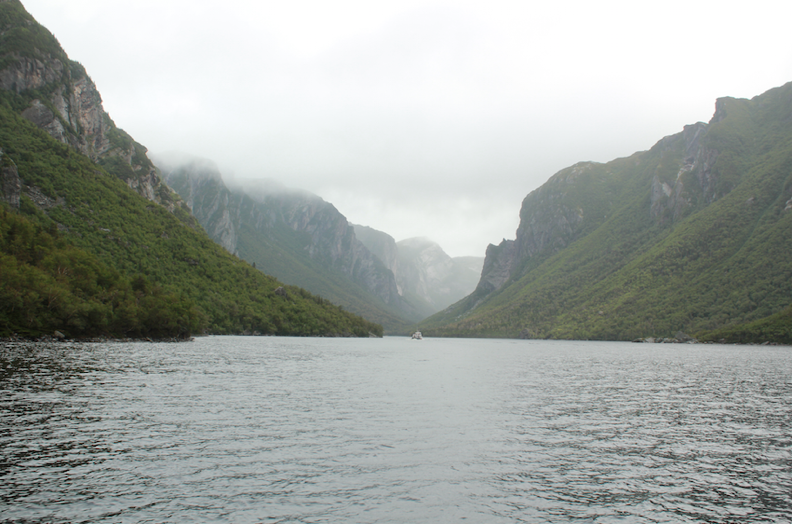 Both Cantine and Goldberg, are currently working on research projects in Newfoundland with Bergmann: Marjorie is a 3rd year graduate student looking at the geochemistry of the sediments in and around the Gaskiers Glaciation and Mistaken Point fauna. 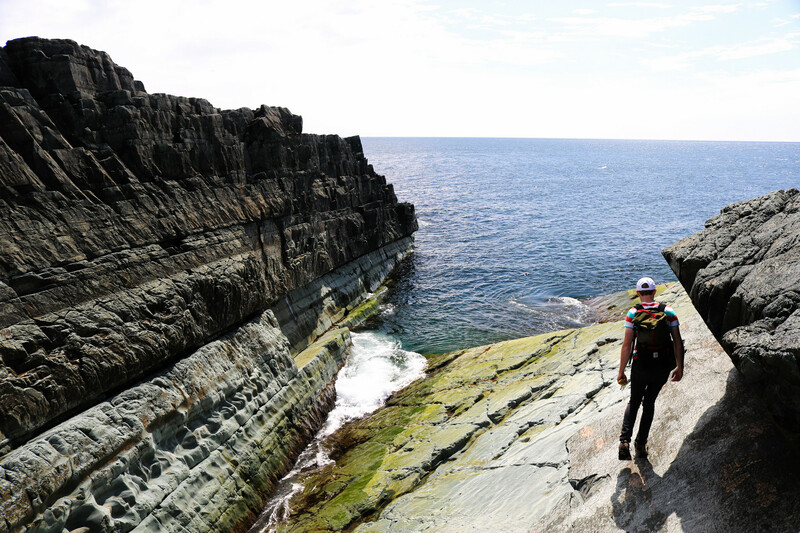 Sam Goldberg is a 2nd year graduate student doing his second generals project on the Cambro-Ordovician carbonate rocks exposed on the Port au Port Peninsula. 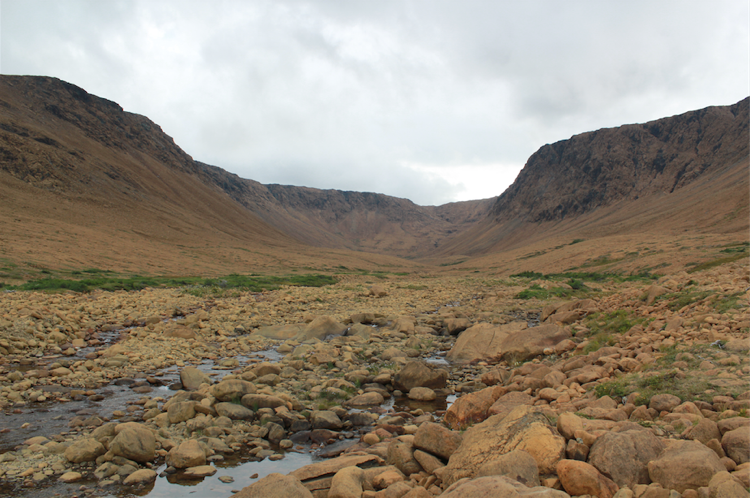 “Recent glacial sediments mark the extent of the Newfoundland Ice Sheet at the Last Glacial Maximum (LGM) across the island of Newfoundland. 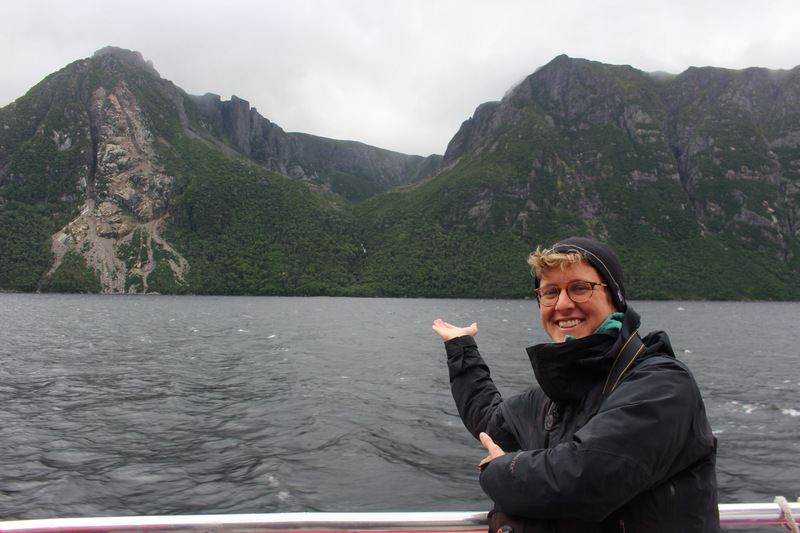 Deposited prior to the isostatic rebound following the LGM, some moraines originally deposited below sea level are now found tens of meters above sea level” says Laura Stevens PhD '17, seen here indicating another glacial feature, a hanging valley, at the western end of Western Brook Pond. 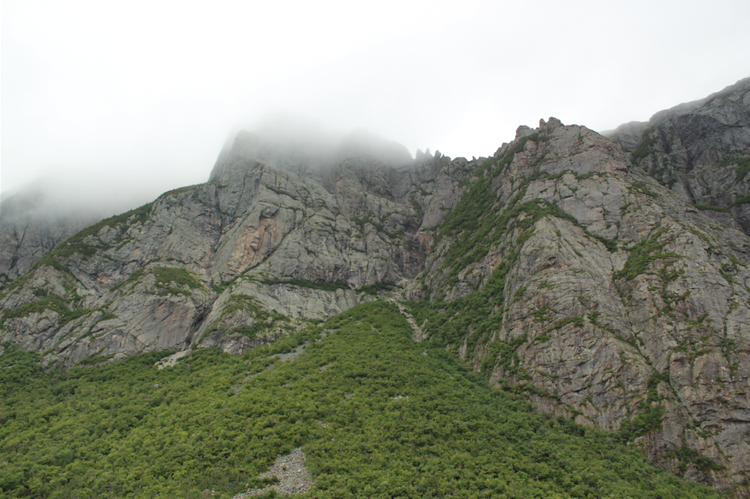 "The Long Range Inlier (seen here in a photo taken by Sam Goldburg) records the Grenville Orogeny, a period of mountain building one billion years ago," says Eva Golos. 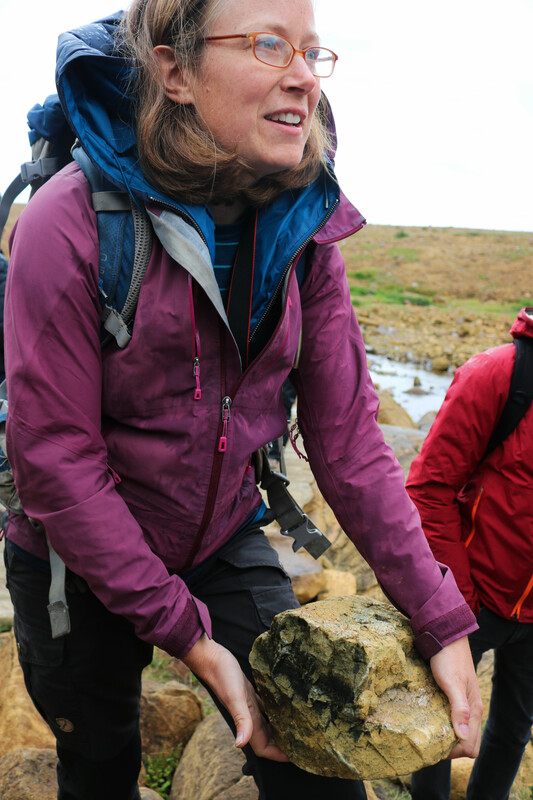 Jennifer Kenyon’s expert topic was the biostratigraphy of the Cambro-Ordovician GSSP. Kenyon says “We visited the Cambro-Ordovician GSSP (the physical point on Earth where we can observe the transition between these two periods). 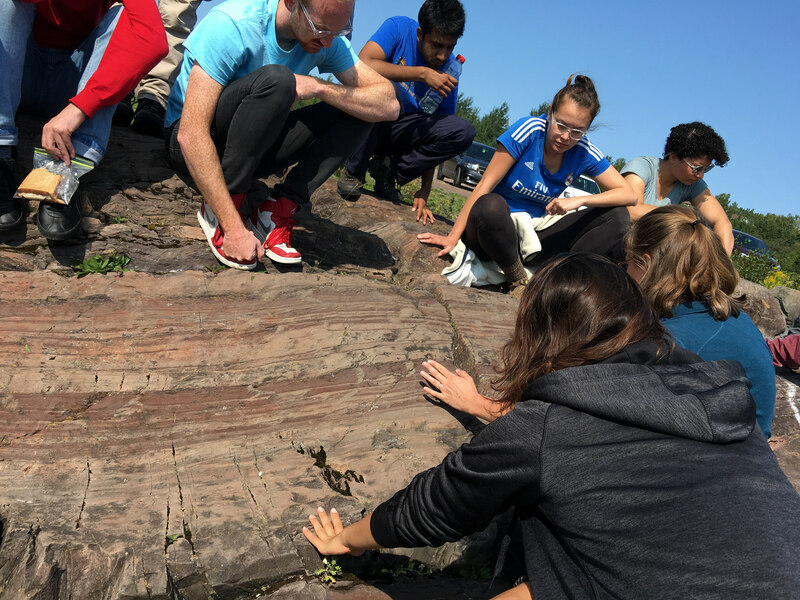 Students were able to go fossil hunting as they learned about the different species that defined this boundary (although it was a little too rough and windy to be successful). 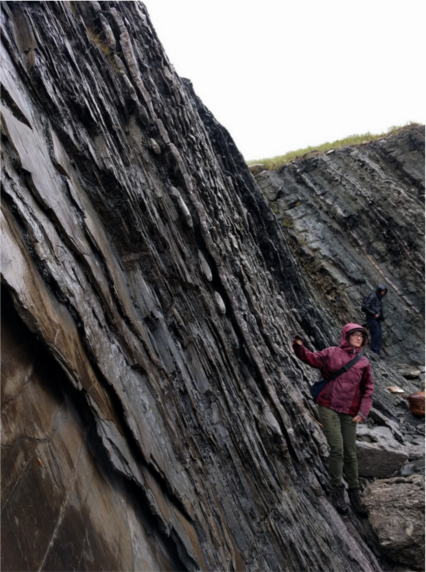 We also got to observe shale, limestone, and mudstone sequences that were in an overturned section, meaning that the older rocks appeared on top of the younger rocks.” Here we see Stephanie Brown with the Cambro-Ordovician GSSP behind her. 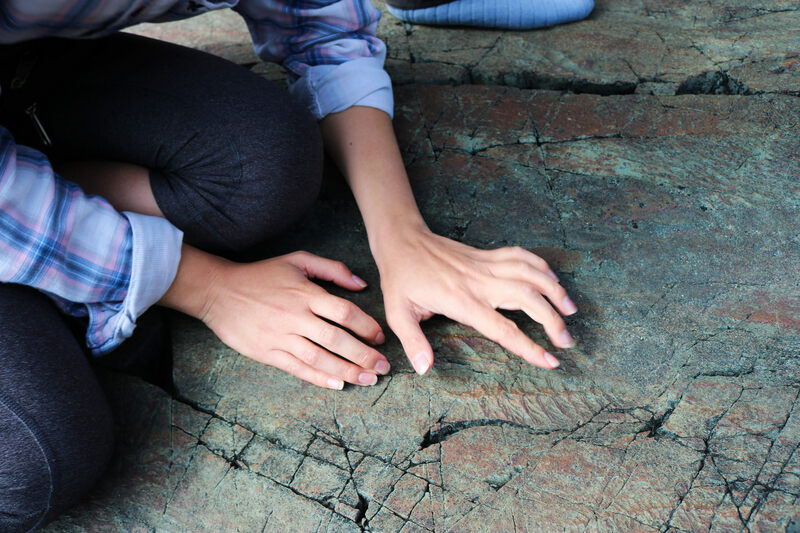 Ekaterina Bolotskaya, whose expert topic was Mistaken point fauna, says members of the trip saw “two surfaces with the fossils of the oldest large complex life-forms found anywhere on Earth (Ediacaran - 580-560 million years). 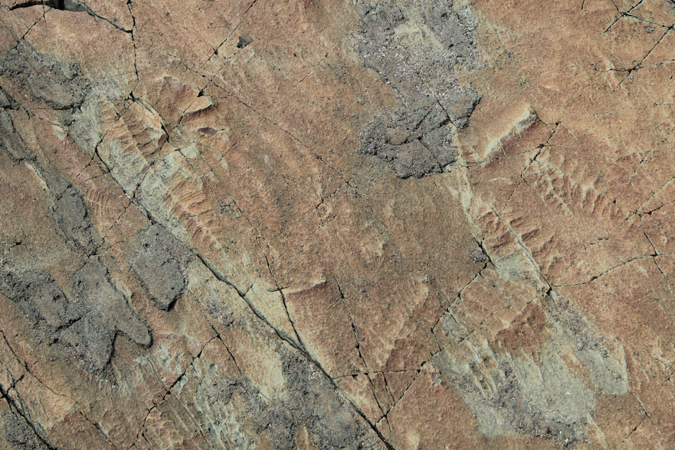 The fossils [examples of which can be seen in the above photo taken by Sam Goldberg] were preserved by being buried by influxes of volcanic ash-rich sediment, containing zircon, which enabled geologists to accurately date them.” Bolotskaya explains “All the fossils at Mistaken point can be grouped into four categories: spindle-shaped (e.g. Fractofusus misrai, Fractofusus andersoni), leaf-shaped (e.g. Charniodiscus procerus, Charniodiscus spinosus, Charnia), round-lobate (e.g. Ivesia), and radiating (e.g. Bradgatia)."